The Regiment was raised in 1900 for service in the second Boer War as the 20th Battalion Imperial Yeomanry. In 1902 it became a regiment and was renamed the City of London (Rough Riders) Imperial Yeomanry, taking the name ''Rough Riders'' after a body of volunteer horsemen who had fought under Colonel Theodore Roosevelt in the Spanish-American War of 1898. Initially its Regimental Headquarters was in the Guildhall but from 1907 to 1914 it was in Finsbury Square, the funds being raised from the City of London and from the Livery Companies. 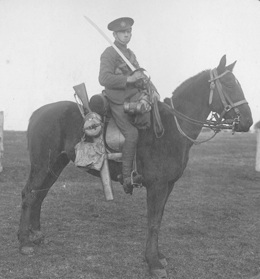 Upon the establishment of the Territorial Force in 1908 it was retitled the 1st City of London Imperial Yeomanry and at the start of WW1 it consisted of four Squadrons attached to the London Mounted Brigade. The Regiment served as dismounted infantry in Gallipoli where it fought in the battle of Scimitar Hill and suffered heavy casualties. It was then evacuated to Egypt, moved to Salonika in 1916, and returned to Egypt to participate in the advance into Ottoman-controlled Palestine. In 1918 it formed E (later 103) Battalion, Machine Gun Corps, serving on the Western Front. After the reconstitution of the Territorial Force in 1920 the Regiment was reduced to a Battery of the 11th (HAC & COLY) Brigade RHA. One of its outstanding achievements between the Wars was to win the King's Cup (open to all RHA regiments in the Territorial Army) on the two occasions on which it entered in 1928 and 1933. In 1938 with the approach of WW2 the Battery was enlarged to form 11th (COLY) Light Anti-Aircraft Regiment RA. It was based in London during the Blitz, along with many other Territorial Regiments, and from 1942 was in active service in North Africa and Italy. In 1947 the City of London Yeomanry was reconstituted as an Armoured Regiment in the RAC, equipped with tanks; and in 1956 it converted to infantry becoming a battalion of the Rifle Brigade (Prince Consort's Own). Thus in the sixty years from its formation to its amalgamation with the Inns of Court Regiment the City of London Yeomanry changed its role no less than seven times: it was in turn Cavalry, Machine Gun Corps, Royal Horse Artillery, Royal Artillery, Light Anti-Aircraft Artillery, an Armoured Regiment and finally Infantry. On 1st April 1961 the City of London Yeomanry and the Inns of Court Regiment amalgamated to form the Inns of Court & City Yeomanry . In 1952 Her Majesty Queen Elizabeth The Queen Mother had been appointed Royal Honorary Colonel of the City of London Yeomanry, and she graciously consented to continue as Royal Honorary Colonel of the amalgamated Regiment. 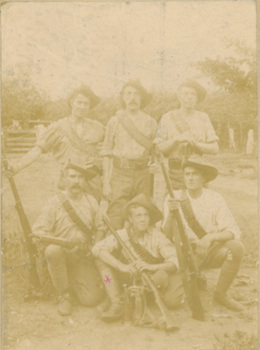 Troopers Lancaster, Weldin, Ackesly & Ede with Trumpeter Williams and Corporal Rutter from 76 Company, 20 Battalion Imperial Yeomanry 'The Rough Riders' at Ladybrand, South Africa on 4 February 1901. 2Lt John Douglas George (1896-1984) on his mobilisation in WW1. He served in both World Wars, seeing action in Gallipoli, Egypt and Europe and rose to the rank of Lt Col. The Rough Rider was awarded the OBE and six campaign medals, including the United States Army's Fifth Army Plaque for exceptional meritorious performance of duty from 1944 - 45 during the campaign in Italy while serving with the USA's 2D Group Pioneer Corps. 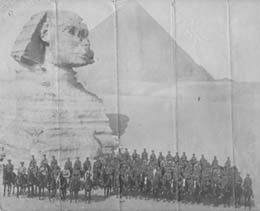 B squadron CLY in Egypt 1915.